It goes without saying that driving is a predominantly visual task. Seeing in front of you is a given as long as your windshield is clean, but seeing to the sides and behind you is a bit trickier. All cars have blind spots that you have to watch out for, but with these tips to adjust your car mirrors for maximum visibility, you’ll significantly improve your vision and safety on the road. 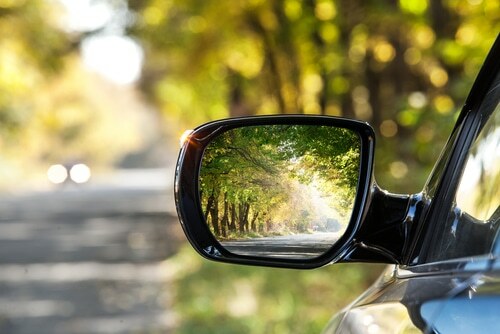 In 1995, the Society of Automotive Engineers (SAE) published a paper recommending the proper way to adjust side mirrors to eliminate blind spots. The SAE advocates adjusting the mirrors in a more outward direction than you might be used to. This way, the side mirrors’ viewing angle just barely overlaps what you see in the rearview mirror. Unfortunately, many motorists are unaware of this recommendation and adjust their side mirrors so they can just barely see the flanks of their own car reflecting back at them while in a normal seated position. This only creates redundancy with the rearview mirror and allows a larger blind spot to linger. Lean your head to the left and rest it on the window. Adjust the driver’s side mirror while in this position until you can only see a sliver of your car’s left flank in the mirror. When you sit up straight, you’ll notice the mirror now has a much wider viewing angle. Lean your head to the right toward the center console and adjust the passenger’s side mirror while in this position until you can barely see your car’s right flank in the mirror. If you can’t adjust your mirrors remotely, you may need another person to assist you in properly positioning the passenger’s side mirror. If you’re used to driving with your mirrors angled more inward, you should take the time to orient yourself with the new mirror angle before you hit the highway. Parallel park your park on the side of the road and watch how passing vehicles move through your rearview and side mirrors. You’ll notice the transition is smooth without much overlap, which is the goal of adjusting your mirrors this way. When you’re ready, head out into traffic and put your newly adjusted mirrors to the test. The purpose of the rearview mirror is to see the lane behind you and any cars approaching. Before you adjust the mirror, sit up straight in a comfortable position. Holding your head completely still, shift your gaze to the rearview mirror. Adjust it until the entire rear window is perfectly framed within the mirror. At night, remember to flip the tab on the bottom of the rearview mirror for nighttime driving. This dims the headlights of the cars behind you so the light reflected from the mirror into your eyes doesn’t blind you. Resuming daytime driving mode is just as easy – simply push the tab back into its original position and adjust the mirror’s angle slightly if needed. Newer cars with power mirrors automatically enter nighttime mode when it gets dark and resume daytime mode when it’s light, requiring no action from you. Learning the proper way to adjust your car mirrors is a great tip to improve safety on the road. Another way is to keep your car properly tuned up. Whether it’s time for a wheel alignment, brake repair, or other important car maintenance step, trust Scott’s Fort Collins Auto & Repair for timely, reliable service. Stop by anytime between 7:30 and 5:30 Monday through Friday or schedule your appointment ahead of time.